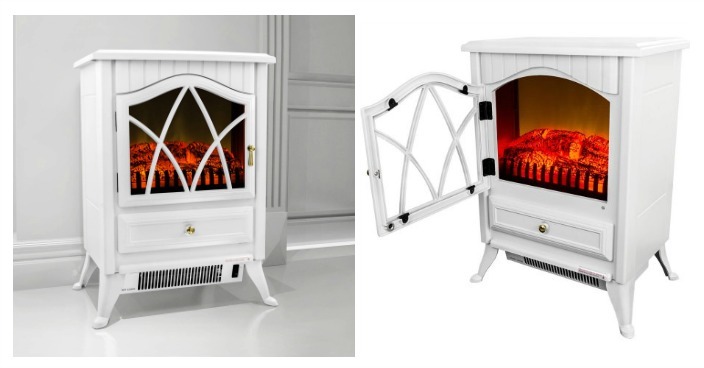 AKDY Freestanding Electric Fireplace Just $99! Down From $296! You are here: Home / Great Deals / AKDY Freestanding Electric Fireplace Just $99! Down From $296! Right now you can get this AKDY Freestanding Electric Fireplace for just $99 (Reg. $296) at Walmart! This snowy white 16-inch electric freestanding fireplace offers the convenience of a space heater with the traditional look and feel of a fireplace. Able to heat rooms up to 400 square feet, the realistic glow of the logs offers two heat settings. Light and easy to move, you can take it into the family room, office, bathroom, or bedroom for a touch of warmth and style.